Palolem beach is one of Goa's most picturesque beaches - a long crescent of golden sand backed by a dense mass of seaward leaning coconut palms. The green Sahyadri Hills rising behind the trees, a rocky island just off the shore and the clear, gentle sea combine to make Palolem every inch the archetypal 'tropical paradise'. Travellers originally came to Palolem to escape the ever growing crowds filling up north Goa's once idyllic beaches. Of course, a great number of tourists followed suit when news of this 'undiscovered paradise' filtered back to the main resorts, and today Palolem can feel almost as crowded as Baga beach or Calangute when it is in peak season. Despite the crowds, Palolem is undeniably beautiful, and the development on the beach is largely confined to low-impact bamboo huts and shacks. The north side of the beach is a little quieter while to the south Patnem beach is a good place to escape to if Palolem gets too much. Outside of peak season the numbers are significantly less, and fishermen hauling in their nets outnumber tourists if you walk the beach in the early morning. We would love to hear about which is your favourite Goa beach, and publish it on our site! 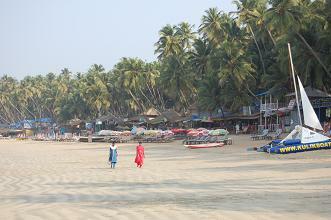 Follow the link to read about other visitors favourite Goa beaches. Butterfly Island - Walk to the north end of the Palolem beach, crossing the narrow footbridge over the stream and you will see Butterfly Island ahead, wadeable from the shore. Follow narrow paths through the island's jungle interior, looking out for wildlife. Alternatively you can hire a kayak (R.300 per hour) to explore around the island. Colom - At the south end of the beach, the small Hindu hamlet of Colom sits around a pretty, rocky cove between Palolem and Patnem. There are basic cafes and accommodation options here set among the boulders and toddi groves. Rent A Bike - Hire a bicycle from Pundalik Gaitondi Road behind Palolem beach (from the beach, walk away from the sea up the main road flanked by shops and take a right turn at the T-Junction) At R.20 per hour, you will have as long as you need to explore the surrounding countryside. Practice Yoga - There are plenty of courses aimed at travellers to choose from around Palolem, including yoga, reiki, t'ai chi or even belly dancing. For yoga, try the sessions at River Valley to the north end of the beach. They have morning and mid-afternoon drop-in classes. 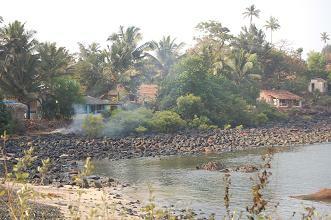 The nearest railway station is a short distance north of Chaudi town, which is 4km from Palolem. Trains run down Goa's coast stopping at Thivim in the north (near Mapusa), Karmali, Margao and Chaudi. It is also possible to reach Chaudi by train from Vasco Da Gama, near Dabolim Airport. Rickshaws or taxis from Chaudi station to the beach should cost R.60 - R.150, or you can get a public bus from town. Buses run frequently from Margao to Palolem, often stopping at Chaudi on the way. They pull into Palolem at the top of the lane that leads down to the sea. The bus stop in Palolem is on Pundalik Gaitondi Road which runs parallel to the beach. From the bus stop a road veers south-west towards the sea. The nearest reliable ATM is at Chaudi, so bring enough money to see you through a few days to avoid making the trip too often. Several licensed money changers operate in Palolem. If you are a confident driver, hiring a scooter or bike can be a great way to get around and explore the surrounding countryside. See our section on hiring a bike for some essential tips. You will need a photocopy of your passport, and can expect to pay around R.200 a day for a good scooter, more for a bike. Water shortages in the Canacona district in which Palolem is situated have been blamed on the increase in tourism to the area. Visitors should try and limit their water use, perhaps opting for bucket showers and avoiding water toilets when possible. Many guesthouses have shared washing facilities. All along the beach front, shacks offer bamboo hut style accommodation, some of which is very cheap for longer stays. If you want to stay on Palolem beach, ask a number of shacks, checking the quality of the rooms, before you settle on one that you are happy with. The north end of the beach is a little quieter than the south and it can feel quite secluded looking out over the estuary and island, rather than the main stretch of the beach. Prices here are fairly high, though you will find a good deal if you secure a hut in River Valley, a friendly and cheaper option. German/Goan run Bhakti Kutir on the headland at the southern end of the beach offers environmentally conscious visitors a chance to stay in Indian village style 'Eco-Huts'. The facilities are family friendly, the site is pleasantly situated among mature gardens and there are Ayurvedic treatments offered. There are many expat-run places in Palolem, meaning the food available, as with much of the Goan coast, is interesting and varied. Standards here are pretty high, and there are some excellent places along Beach Road such as Magic Italian serving home made pastas and pizzas, Cool Breeze specialising in steaks and tandoori and Droopadi on the beachfront which serves authentic Indian dishes. To the north end of Palolem beach, Cozy Nook offers very reasonably priced Goan food and a clean, eat-as-much-as-you-like salad bar in the peak season. Ordo Sounsar just across the footbridge is another good choice, serving freshly caught fish and seasonal produce. A slightly higher price tag is reflected in the quality of the cooking. Budget travellers will find that many beachfront shacks have reasonably inexpensive, if rather uninspired menus. For some good south Goan breakfasts and authentic chai, head to the cheap, Hindu-run Shiv Sai on the Pundalik Gaitondi Road (by the bicycle rental place). Good, cheap thalis can be found at Sevas to the south end of the beach, heading towards Colom. Thinking of heading to Gokarna? Palolem beach makes an excellent stopover location if you want to break up the journey. Chaudi's train station lies en route to Gokarna.